Hey there we have some updates for you! 1) Under Reports Menu, we changed Commissions Owed to delineate between Commissions Owed (Date Completed Range) - which was the default and - Commissions Owed (Date Invoiced Range). We have some customers who don't pay commissions until the job is invoiced. 3) Alot of new Imports from law firms have been added. 4) We have added full integration to scan to Google Drive instead of Amazon S3. You can do both now. We will be releasing good documentation for the setup on this. 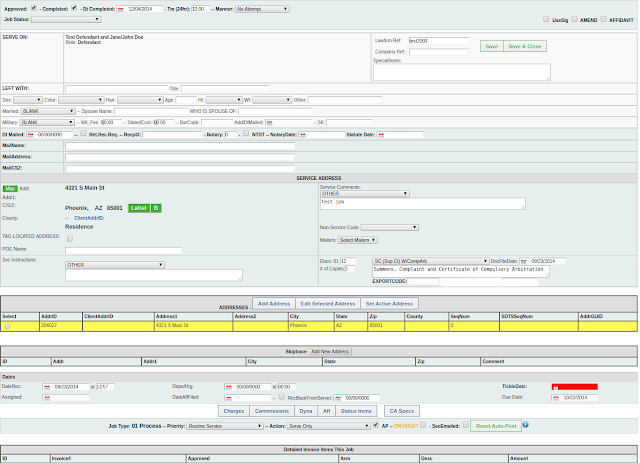 5) Under Configure->General Setup->Process Server Detail we have added commission options to the zip code coverage!!!! If you set the ApplyNonServeComm and ApplyServeComm to YES, it will auto-apply those commissions when the job is completed and approved. We have a new office now in Cebu. It is a mock process serving agency! We do everything except serve legally-binding papers on people. We will be using it to make you nice videos showing you how to do the more advanced things in the program along with some suggestions to optimize your work flow. We are also listening hard to you. Keep your ideas and suggestions coming. We are implementing them. Have a good holiday season. When I served, it sucked because everyone goes on vacation and all my bills sat an extra month to get paid.